A new Bureau of Customs regulation exempting Overseas Filipino Workers (OFWs) from paying taxes for “balikbayan box” is just two signatures away to be fully implemented. The said regulation will be implemented in October 2016. 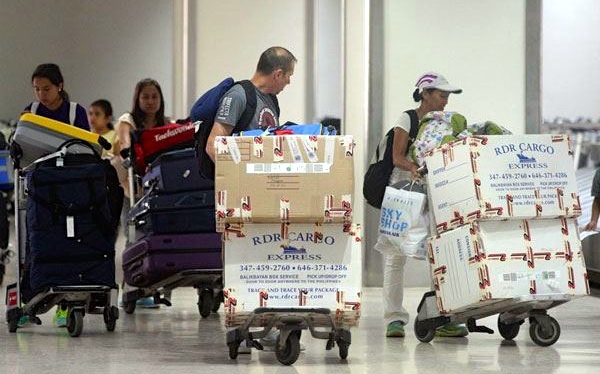 Under the regulation, Filipinos who have been living in another country from six months will be allowed more to bring home a minimum of 150,000 pesos tax-free Balikbayan box. Any item not more than 10,000 pesos (sale price) will also be tax free. The bureau has also appealed to Filipino businessmen not to take advantage of the new policy. Customs Assistant Commissioner Atty. Althea Acas reminded the public that carrying too much volume of just one item for business purposes is not allowed. “Nananawagan po tayo sa mga negosyante natin at kababayan na huwag ho sanang abusuhin ang balikbayan boxes,” said Acas. The new regulation will take effect once Commissioner Nicanor Faeldon and Finance Secretary Carlos Dominguez signed the document.